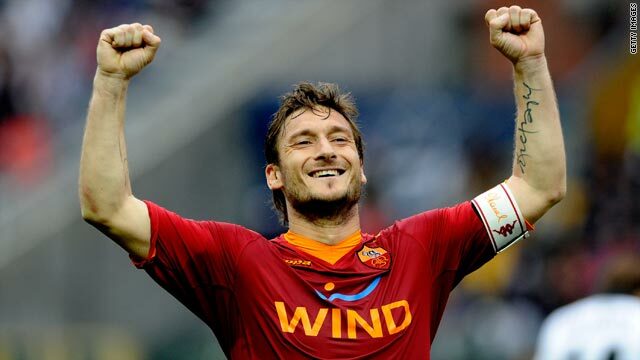 Roma captain Francesco Totti celebrates his opening goal in the 2-1 victory at Parma on Saturday. (CNN) -- Roma returned to the top of Serie A with a 2-1 victory at 10-man Parma on Saturday to keep the Italian title race on a knife edge. Champions Inter Milan, who reached a first European Cup final since 1972 in midweek, now trail by one point ahead of Sunday's trip to Roma's capital rivals Lazio. Claudio Ranieri's team, who face Inter in the Italian Cup final, bounced back from last weekend's 2-1 defeat by Sampdoria to revive their title hopes with two matches to play. Captain Francesco Totti opened the scoring in the fifth minute after showing great control to chest down Daniele De Rossi's pass and lob Parma goalkeeper Antonio Mirante. Totti also hit the post 10 minutes into the second half, and then the veteran striker's cross allowed Rodrigo Taddei to head the second goal with 15 minutes left as Parma -- employing four strikers -- pressed to equalize. Totti was also involved as 10th-placed Parma had Luis Jimenez sent off for the third time since his loan arrival from Inter in February, with the Chilean receiving a second yellow card for a foul on the 33-year-old with two minutes left. "I told my players to battle and then see if the ball would run for us. Last week it went against us but today it went for us," Ranieri told reporters. "I'm not thinking about Lazio but obviously if they play their part, tomorrow's game should be a tough one to win." Third-placed AC Milan almost certainly clinched qualification for next season's Champions League with a 1-0 win over Fiorentina despite being reduced to 10 men. Brazilian forward Ronaldinho netted the only goal from the penalty spot in the 78th minute after Mario Borriello was fouled, but teammate Massimo Ambrosini was sent off for a second bookable offense with two minutes to go. The victory was a boost for coach Leonardo, who was criticized by club president Silvio Berlusconi in midweek and faces an uncertain future. Milan moved nine points clear of fifth-placed Palermo, who travel to second-bottom Siena on Sunday, needing to win handsomely to redress a nine-goal inferior for-and-against ratio. Sampdoria, two points above Palermo, host bottom club Livorno.